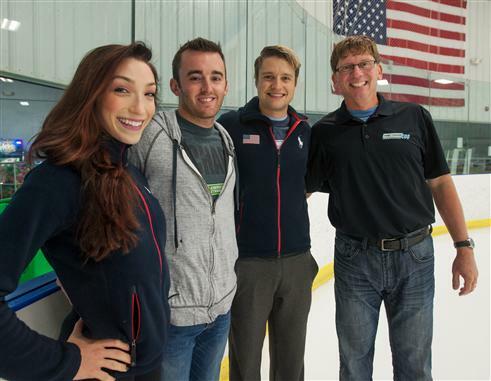 When NASCAR Sprint Cup Series rookie Austin Dillon wants to learn to ice skate, he goes to the best. On July 31, Dillon took a lesson from Olympic gold medalists Meryl Davis and Charlie White at the G-M Arctic Edge Ice Arena in Canton, Mich. In all fairness, though, I don’t really know if Dillon really wanted to learn to ice skate. The lesson with Davis and White was part of a protion for the Aug. 17 Pure Michigan 400 race at Michigan International Speedway in Brooklyn, Mich. But pre-lesson desire or not, word has it that Dillon was a natural on the ice and a good time was had by all. Davis and White will be on Dillon’s turf for the upcoming NASCAR race at Michigan, serving as grand marshals with the duty of giving competitors the command to fire their engines. Maybe sometime during the race weekend, Dillon can give them a taste of his world, either by taking them on a tour around the track in the pace car or maybe a higher-speed tour giving them each rides in a modified two-seat race car. Okay, maybe that wouldn’t really be like a lesson, as Dillon would be driving. But there are driving schools and fan experiences. Richard Petty Driving Experience, anyone? Davis and White aren’t only good at dancing on the ice. They’re also pretty good on the dance floor, as evident in the most recent season of ABC’s Dancing With The Stars. Davis also took home that trophy. Dillon competes week-in and week-out at the top level of stock car racing. Before reaching that pinnacle, he played in the Little League World Series. Now he’s getting skating lessons from a a couple of gold medalists. Is ballroom dancing next? I admit, since Helio Castroneves won Dancing With The Stars a few years back, I’ve been hoping for a NASCAR driver on the show. Honestly, I don’t see it happening, given the nature of the NASCAR schedule and the other obligations that go along with it. But if it could happen, could Dillon be the one to do it? Maybe he should hit up Davis for some lessons, just in case.